The up to 125 shacks the Anti-Land Invasion Unit has repeatedly demolished in the Marikana informal settlement in Philippi East were unoccupied, says the City. 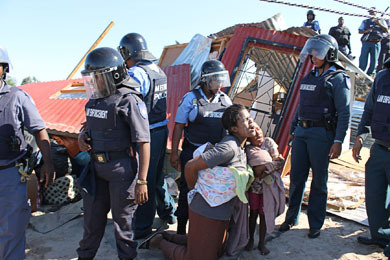 However, a number of Marikana residents, who have been trying to set up home on the city-owned land piece of land on Symphony Way for the last two weeks, say their shacks were demolished while they were still inside them. Following the Anti-Land Invasion Unit having returned four times since April 25 – the last time being on Thursday last week – the homeless families are setting up makeshift shelters of plastic and cardboard at night and taking them down during the day. Responding to questions submitted last week, Mayco member for Human Settlements, Thandeka Gqada said residents build shacks illegally on city-owned land then leave them unoccupied and carrying on living in their original dwellings. But Xolani Mswabi said he was one of the Marikana settlers whose shack was demolished on May 1 – the third time the city had cleared the shacks after residents rebuilt them – while he was still inside it. Mswabi said all his belongings were inside the shack when the ALIU pulled it down. “My shack was destroyed more than two times and the last time on May 2. They took the material that was left to cover myself. No one was given notice and we’ve been telling City of Cape Town that we have no other place to live,” he said. Mswabi came close to being arrested on May 1, along with Mzwamadoda Fingo, when he grappled with law enforcement officials in a bid to demolish his shack himself rather than let the ALIU officers do it. “With anger I pushed them because the material was going to fall on top of my cardboard, one of the officials pushed me. They grabbed me, pressing me down but some police officers intervened and they left me,” said Mswabi. Zoe Zulu, 36, a mother of two children, said her shack was also destroyed while she was inside, feeding her five year old daughter on May 1. Zulu has since been given shelter at the St John’s church while searching for another place to live. She said as her shack was pulled down her one-month-old son, who was strapped to her back was struck by a falling piece of building material. “I only noticed later, because he struggled to sleep. Some of the people told me that he was hit,” said Zulu. The informal settlement, which residents dubbed Marikana as they said like the platinum workers, they were prepared to die for their rights, was first occupied by about six shacks two months ago. Late in April, the number of shacks increased drastically and the homeless rights organization Abahlali baseMjondolo took up the Marikana cause. Marikana residents are predominantly former backyard residents who say they can no longer afford to pay the R500 per month rent their landlords demand. Abahlali baseMjondolo representative Cindy Ketani said the City’s claim that the shacks were unoccupied was “totally rubbish”. She said the City was trying to ensure they were not prosecuted for conducting illegal evictions as they were supposed to provide the residents an alternative place to live. Gqada confirmed that 125 structures were demolished on May 1 and 11 on May 2. She claimed all the structures were unoccupied and thus the city had no legal obligation to obtain an eviction order. Asked if the residents were warned of impending demolition, she said they were “verbally warned”. She said the City did engage with the residents who said they had been living in backyards.